National treasure, and without doubt one of Britainâ€™s most talented and best loved comedians & performers, Billy Pearce emerged from the fertile talent fields of Butlins in the mid 1980â€™s. 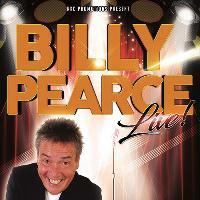 Multi Award winner Billy, has won just about every comedy award going, including a British comedy award, Solo comedian of the year, and Best television comedy newcomer at the London Palladium. The dance school were always short of boys, so Billy and his younger brother Andrew got dragged in. The first time he went on stage was as a 6 yr old child at the Empire in Leeds, and he was a Siamese twin in The King and I. He never for once imagined, he would still be in the entertainment industry, more than half a century onâ€?.In fact, he thought he would end up working in a foundry, until fate intervened and almost killed himâ€? Do you promote/manage Billy Pearce? Login to our free Promotion Centre to update these details.